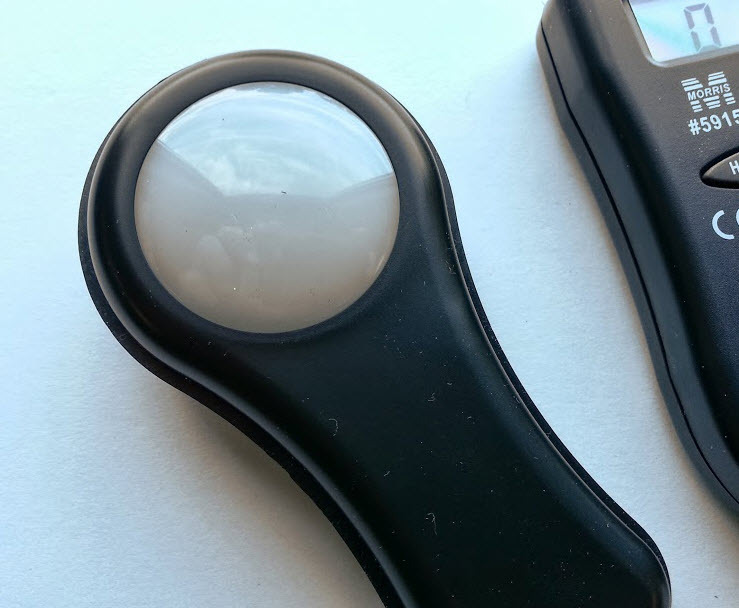 Light meter with a digital readout gives measurement in both footcandles and lux. 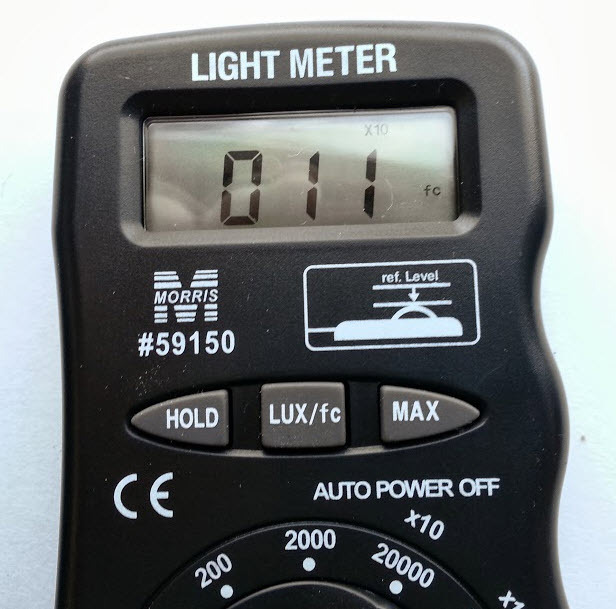 It gives you all the accuracy you need to correctly determine the light levels you have in any type of space. It's calibrated to a standard incandescent lamp at 2856K. It's perfect for offices, homes and industrial situations where it's important to have the right illumination. 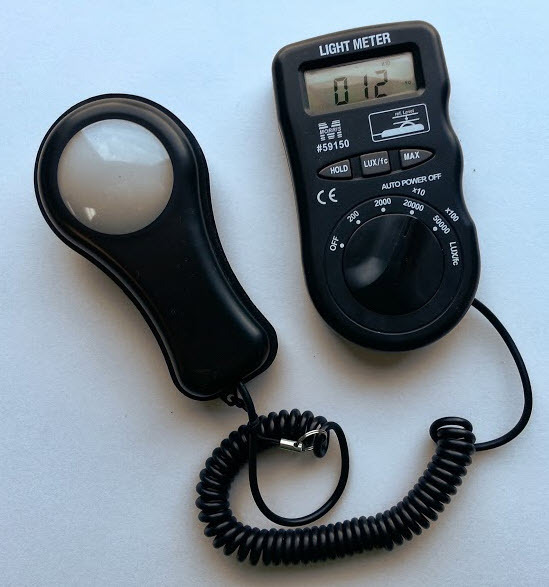 This light meter is an easy to use instrument that you'll find to be very helpful. - 3 1/2" Digit LCD Display with Low Battery Indication. - Resolution To 0.1 Lux Measurement; 1 footcandle = 10.76 lux. - Measuring Range 200, 2000, 20000, 50000 Lux. - 20000 Lux: Reading x 10, 50000 Lux: READING x 100. - Includes One 12 Volt Battery. - Light meter weight: 5.6 Ounces. Lighting controls for light fixtures. made products whenever possible and many times we can do just that. The quality of products made here in the USA is superior to a lot of the imported stuff that comes in. But of course, there are times when we can only sell and imported product. But be assured that we get just the highest quality proven products that will last for the long term for you. One of the services that we provide is doing layouts for people that need to know how many fixtures that they will need for their situation. It’s essential that we understand what you’re going to be doing underneath the lights whether it be a manufacturing facility, a warehouse or if the work is general lighting or delicate tasks. It matters because then we can help you determine what kind of foot-candle level you’ll need so that people can be the most productive they can in the workplace. It’s crucial to get lighting right the first time, so a lot of costly adjustments don’t need to be made later. And one of the things that we like to see people invest in is a lighting system that works with them far into the future.